CBS News reported an AP story late yesterday evening regarding a Canadian Pacific oil tanker train that derailed near Parker Prairie MN, toppling 14 of the railroad cars, each carrying up to 30,000 gallons of oil apiece. Fortunately, only three of the cars leaked spilled oil, and that was more or less contained by the snow covered sidings, but the results could have been far worse. The simple truth is that mankind can never control anything to the extent we'd wish possible. No organization in history has tried to exercise more conscientiousness, contingency planning or impeccable execution than the National Aeronautics and Space Administration and despite a massive budget and myopic oversight they still managed to produce the Apollo 13 disaster. The Space Shuttle program also showed us we can control an awful lot of things, but we can't control every little thing as much as we wish we could. It’s truly remarkable we actually managed to propel humans to and from the moon successfully, though the voyage was far from uneventful. Another federal agency charged with such conscientious oversight was the Nuclear Regulatory Agency, the very same folks who brought us Three Mile Island with their impeccable expertise. It's a wonder that mishap didn't rank right up with Chernobyl. It’s what common folk refer to as the law of unintended consequences, meaning actions may or may not produce the intended results, but even in the best of cases, there are unforeseen consequences seldom anticipated. Science has identified this principle as one of the immutable laws of physics. It seems if you throw a ball at the floor with the same force, trajectory and speed over and over, it will repeatedly hit the same spot on a nearby wall. However, if this is repeated enough time, it will eventually do something entirely different and unpredictable. This is referred to as Chaos. Apparently the train left the tracks due to a mechanical failure – a loss of air pressure triggered emergency braking systems – a safeguard no doubt installed to prevent accidents of one type or another. It would only be fitting to the ironic nature of the world we live in if the spill was caused by a system present specifically to prevent spills. Fortunately no one was hurt in the accident and work crews were quickly able to control the spill thanks to snows absorbent properties. An estimated 20,000 to 30,000 gallons leaked onto the ground, according to Minnesota Pollution Control Agency spokesman Dan Olson. Thanks to the snow, it is believed the oil has not contaminated the local water supply, despite one car that dumped close to 26,000 gallons of oil on the ground. They won’t be sure any environmental damage was done until morning, but we’ll keep our fingers crossed. Nevertheless, what does this say about building a pipeline for Canadian Oil across the Ogallala Aquifer? So do you really want to build a pipeline that will have no effect on gas prices, endanger the water, wildlife and agricultural heartland of America, just to help a Canadian energy company grow wealthier? We hope the thought gives you pause. 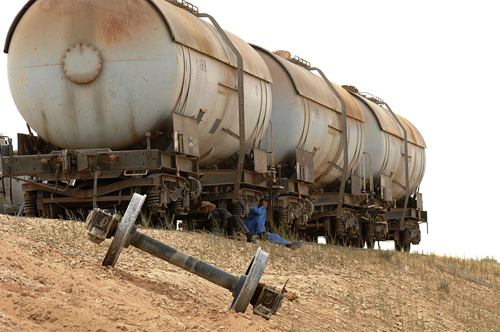 Image: Derailed Tanker cars in Iraq circa 2010. Image from Wikimedia Commons, public domain. Isn't the point of a pipeline that we would not need to move the oil via rail? An event that results in no oil into the ground, all cleaned up is a spill? I agree, rail transport is much more likely to have spills than a pipeline. By the way, was this in MI or MN? Everybody wants to drive cars, watch plastic TVs, play with plastic cell phones, eat food transported from 1,000 miles away, send rockets into space, have the convenience of air travel, and do all of the other things that we as modern humans enjoy thanks to our ability to harness the energy of petroleum. But nobody wants oil to be involved. Amazes the hell out of me. We had better tread lightly here. If we do not approve the XL pipeline, Canada will find other markets. If XL dosen't get built they will build the Northern Gatway line to the west coast, with an upgrader to ship to Asia, and there is talk about a new line going east to New Brunswick for customers there, but thay too could upgrade it and ship it away to markets. Once these are in service there will be little desire for a line south to us. People on earth will never stop using oil until it is all gone.